By Jacqui	| Published on Monday, May 16, 2011. Today's interview with Los Angeles-based street artist Morley is brought to you by the dazzling FatCap Editorial Assistant Jacqui Munger. I recently had the pleasure of following Morley around Hollywood one Sunday as he hit up a few of his favorite spots. During our time together, I discovered that Morley is as quirky and articulate in person as he is in his blog. The soundtrack to our Sunday afternoon street-art shenanigans had Atmosphere vibrating the car speakers one minute and sweet Blossom Dearie crooning to us the next while our chatting took us from his cat to superhero powers to healthcare to reality TV to his wife (and sometimes back again to his cat). It was all quite the experience, complete with a few Morley Fan shout-outs from passersby in the street. 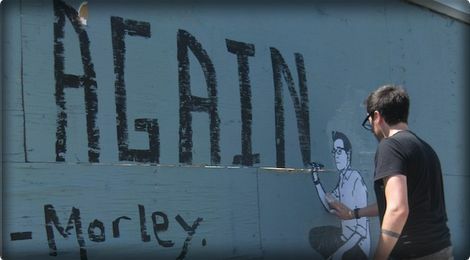 Morley’s clever and often poignant wheatpaste slogans dot the Hollywood landscape in an attempt to bring some humanity to what can be a soul-stealing LA world and here we have exclusively for you some words straight from the horse’s mouth. Interview below with Morley on advertising, movie making, the tragedy of New York, and more. FC: Let’s start with introductions. Where does your name come from? Morley is actually my middle name. It’s a family name and as a kid I was always embarrassed of it. It just sounded so dorky and un-hip. The funny thing I’ve found as I’ve grown up is that the very things that I desperately wanted to shed as a child, I’ve learned to value as an adult. The flaws and insecurities, the things that betray any kind of persona I’d like to convince people of, are in truth, a kind of gift. They prove our humanity and help us keep perspective on who we are. There’s a strange freedom in embracing one’s true nature, pimples and all, because the truth is that I’m kind of dorky and un-hip. So now the name seems to fit nicely. FC: When and how did you become involved in street-art? I started doing street art while living in New York from 2000-2004 and attending college at the School of Visual Arts. At the time I was silk screening slogans on contact paper and putting them up around the subway. I was seeing artists like Shepard Fairey and Neckface getting up and while I liked their stuff, I wanted to send messages a little more candidly communicative. Once I moved to Los Angeles the need to do this became even more undeniable, as it seems as though everyone here is living in the shadow of what they’d rather be doing with their lives. It was here that I decided having a reoccurring visual theme would elevate the slogans beyond just the words. I landed on images of me drawing the words because it reminded people that someone was speaking to them and thus added a new layer of solace. FC: You’re from Iowa. What influence did moving to big cities in New York and now to Los Angeles have on you? The irony of moving to the big city was that it didn’t really alter me so much as it made me acutely aware of where and what I come from. It was a bit of a tragedy actually. I had moved to New York to go to college and hoped that in doing so, I could finally create the life I’d fantasized about while living in Iowa, only to find that even in New York I was still just me. I think the defining characteristic of any major city is that they can be soul-crushingly lonely places and rife with slowly dying dreams. For this reason they are the perfect place to do what I do. FC: Why did you move to LA and how do you like it compared to NYC or your hometown? I moved to Los Angeles to make films. As a screenwriter and director by trade, this was the only place I could hope to ply my craft. The disappointment and frustrating aspects of the industry only further motivated me to create in a medium that requires no permission and can thrive with limited resources. Of all the cities I’ve lived in, I find Los Angeles agrees with me the most. Being surrounded by a city full of unabashed dreamers is invigorating. Of course I miss the seasons in my hometown, though perhaps not the duration (winters in Iowa are pretty unbearable). I miss the energy of New York even if at times it can be exhausting. Over all though, I think the West Coast environment is most conducive for what I want to do. FC: Do you need anything in particular for your creative process? It sounds odd but rejection in all its many forms seems to be a fuel that never runs dry. The flip side of that is the support I get from my wife and loved ones is a huge requirement as well. On a more literal level, music is vital and having my cat nearby helps a lot too. FC: How do you come up with your slogans? I consider myself first and foremost a writer. It’s what I think informs my work the most and so the slogans come from trying to tell a story in a single phrase. I think what people want from art is to communicate something they feel but cannot express. To see it or hear it outside the confines of their own head creates the relief in knowing that they are not alone. So the slogans come from things I believe someone out there might need to see. Whether it’s a bit of encouragement or just something humorous that they can relate to, my goal is to bring a voice to the impulses we often have to be brutally honest but almost never act upon. FC:Do you feel the work you are doing is something that should be preserved or just stay ephemeral? That’s a hard question to answer. If I’m being honest, I don’t worry about my stuff being preserved, but there are many great artists to which watching their work get buffed or torn down is heartbreaking. That said, I don’t think anyone who creates in this medium expects it to last forever. The materials we work with lend themselves to short lifespans and we don’t own the property that we appropriate, so to get upset when it is taken down would be silly. The fleeting nature of what we do is part of the beauty. FC: What’s your perfect spot for the perfect poster/sticker placement? The perfect spot has a mixture of visibility and protection. You can usually have one without the other but not both. If it’s a spot where a lot of people will see it, that usually means it’s gonna get taken down pretty quick. If it’s a spot where it’s likely to ride for a while, that’s usually because it’s not as visible. Advertisers are pretty savvy about placement so it’s good to learn from them and, if at all possible, subvert them. FC:You post pictures of your art and thoughtful reflections on the processes of putting up your stuff in your blog. What has been the reaction to your thoughts? Has it fueled your art in anyway? It’s been great. I think people connect that much more to my work because of it. My desire to be an alternative to the street artists that we’ve come to celebrate was a big part of the reason I started doing this at all. I admire Banksy greatly but I always knew that I simply wasn’t cool enough to be Banksy- and then it hit me, I don’t know Banksy, how would I know if he’s cool? I wanted to present myself in as honest a light as possible. To be the viewer’s friend as opposed to a perception that they may or may not feel any real connection to. My work is visually different than most of my contemporaries and I wanted to couple that with an amount of disclosure and vulnerability that would compliment it. So far, so good. FC:Have you received unexpected reactions? It’s unexpected whenever someone writes me with kind words of encouragement or tells me that my work means something to them, but those reactions are more than welcome. With the Internet so overwhelmed with mean-spirited cynicism and snarky comments hidden behind the cowardice of anonymity, I’m always surprised when someone says something nice. It’s refreshing though, to be sure. FC:In your blog you mentioned that you see street-art as a way to speak out against the prevalence of advertising in our city. Can you talk about what this means to you and your art? I could go on and on about this but I’ll try to be brief. Simply put, it is impossible to escape the all-powerful hand of advertising. If you live in a major city you are forever bombarded with images screaming promises of fulfillment at you from every direction. If you buy this or watch that, then maybe you can finally stop feeling like nothing makes sense, and that lasting happiness is more than a myth. But they just want your money and they don’t care if women hate their bodies because they don’t look like photoshopped pop stars hocking perfume, or if men have lost all concept of identity to a glut of mixed messages. My feeling is that with all these ads selling the unattainable, why not give something positive away for free? FC:It seems like you’re very conscious about where you place your work in terms of the environment and other artists’ stuff that is already there. Why do you consider this important? I do my best to respect the other artists mostly because I would hope for the same measure of respect from them. I do think there is an unspoken code within the community and it’s important to observe it. We all put our heart and soul into this and there’s no reason why we can’t share the streets. FC:If you could bring to life any fictional character from a book or movie, whom would you choose? Doc Brown from Back to the Future. Can he still build a time machine or would that only be in the world he came from? If not then, Chewbacca. Yeah because as a child (and grown man) I always fantasized about having Chewbacca as a best friend. He's loyal and strong, could beat up bullies and probably wouldn't secretly have a crush on your girlfriend. FC:If, instead of actually writing your name, you now had to “sign” your name with a simple drawing of something, what would you draw each time to represent who you are? I would have to say my glasses. It’s one of the main things people think of when you ask them to describe me. Plus it would be hard to draw a "simple" version of my huge biceps and six pack abs. Police: Someone has to do it. Bus Stops: Wish I spoke Spanish. Check out The Mother of Invention, a movie written and co-directed by Morley and coming soon to Netflix! Icy and Sot, two renegade street artists recently out of Iran, hit the streets of Chicago, New Orleans, Houston, Austin and finally Los Angeles!